Our way of keeping baseball standings has at least one thing in common with the official way: The Houston Astros are ahead, lopsidedly ahead, in every one of their divisions. 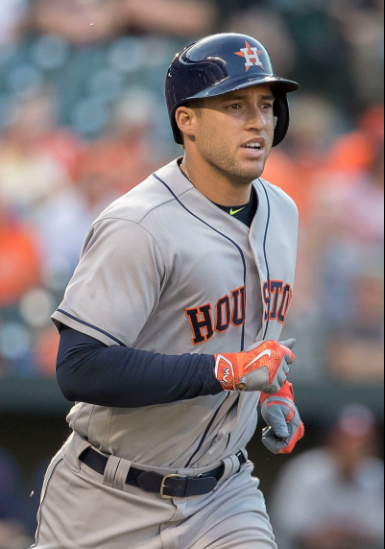 George Springer has five homers and 10 RBI on the Houston Astros' present road trip (Keith Allison/Creative Commons Attributon-Share Alike 2.0 Generic license). The knock against the Houston Astros all year is that they haven't played any good teams. Which raises the question: What counts for a good team in the American League, besides the Astros? 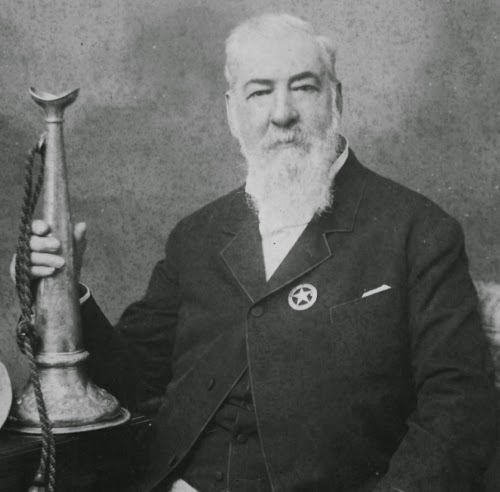 The New York Yankees, you say. They lead the American League East. The Astros beat them three out of four at Yankee Stadium last month. The Astros haven't played the Boston Red Sox, who have the third best record in the AL, behind the Astros and the Yankees. There is one club that has their number. The Cleveland Indians, defending the AL pennant, have beaten the Astros in five of six meetings this year. The Astros are 41-11 against everyone else. In August, the Astros will play three at home against the Washington Nationals, who are trouncing the National League East. But that's really about it when it comes to "good teams" still to play the Astros. Maybe the Red Sox are that kind of team, but maybe they aren't. Same with the Baltimore Orioles. When we consider that the Astros play in the American League West, which doesn't have another .500 team and probably won't have one before the end of the year, it's not hard to imagine a run at 116 wins, which the Seattle Mariners reached in 2001. But it is a lot easier to imagine than it is to achieve. At this point in their 2001 season, the Mariners were 46-12, nearing the end of a 15-game winning streak. The Astros are merely on an 11-game winning streak. The last seven of those wins have come on a road trip during which the club is batting .326 (87-for-267). Jose Altuve is batting .484 on the road trip (15-for-31) and he has reached base now in 32 consecutive road games, going back to last Sept. 19. George Springer is batting .457 (16-for-35) on the road trip with five homers and 10 RBI. Catcher Brian McCann had a mere one hit on the road trip before Monday, when he smashed a two-run homer in the fourth inning to give the Astros a 4-2 lead against the Kansas City Royals. Ever heard of Yuli Gurriel? He hit a back-breaking three-run homer in the top of the ninth Monday night against Kansas City relief ace Kelvin Herrera. The Royals still had a little of a chance before then, but that homer gave the Astros a 7-3 lead. On the road trip, Gurriel is eight-for-18 (.444) with two homers and eight RBI. The point of all this is that the Astros have it working, not just in the official Major League standings, but just about however you want to slice it. The way we slice it around here, we've got the Astros in three divisions, and they are dominating all of them. Last we checked, that wasn't quite so. The Astros were tied with the Texas Rangers on top of the Southwest Conference, 2 1/2 games ahead of the Arizona Diamondbacks in the West League South and one game ahead of the Dodgers in the South League West. Now, the Astros have leads of two, six and 4 1/2 games, respectively, in those competitions. Here's a look at the conferences. We can see that the Colorado Rockies have cooled down a little bit in the Northwest, where the Chicago Cubs have moved to within two games. In the Southeast, the Cincinnati Reds have come down a little after losing two of three at home against the Atlanta Braves last weekend. We know Brandon Phillips didn't especially hurt the Reds in that series, and we also know that Jose Peraza homered for the Reds. But we're still going to say that, unquestionably, the dumbest off-season move for any club this year was the Reds giving the Braves Phillips, plus $13 million of the $14 million needed to pay him. The Reds had tried for years to dump the salary, but Phillip refused to be traded. So, the Reds dumped the player and ate the salary, which defeated the whole purpose of trading him. In return for Phillips (who is from Stone Mountain, GA), the Reds received Andrew McKirahan and Carlos Purtuondo. Okay. The Reds saved $1 million in the exchange, but when you consider that whoever took his roster spot was going to cost at least the big league minimum of $535,000, the savings becomes $465,000. For $465,000, the Reds removed Brandon Phillips from their lineup. In his place, they're trying Peraza. At 23, Peraza may become a good player. If you're saving $13 million by playing him instead of Phillips, this year is a good time to find out. If you're only saving $465,000, it isn't. With Phillips in their mix, the Reds might have a good enough club to reach 85 wins and shoot for the playoffs. With Peraza in his place, they probably don't. The metrics say that Phillips has a 0.6 WAR and Peraza is at 0.3, according to the reckoning on baseball-reference.com. The same metrics say that Peraza is 0.3 WAR to the good offensively, even though his OPS-plus is 64, which is really a minus, The only good offensive numbers for Peraza are his stolen bases, 14 for 16. Offensively, he's Billy Hamilton Lite. More likely, in the rattle and hum of the Cincinnati offense, the Reds would be a couple games better right now with Phillips in their lineup. That would have them breaking even. More to the point, this trade probably will end up costing them a good amount of money. Figuring that the average paid admission runs $100 through the cash register between the ticket, parking, concessions and souvenirs, the Reds would make up the $465,000 they saved by putting an extra 4,650 people in their stadium, total, through the course of the season. Does a playoff contenting Reds club with Phillips in their lineup lure an extra 4,650 people to Great American Ball Park during the course of the season? It probably lures 20 times than many. We'll never know, but it could be that this deal costs the Reds about $10 million in lost revenues, and a chance to contend. In these days when 85 wins makes a playoff contender, no club should ever give up on the season before it starts. The Reds did that with the Phillips trade, and it could cost them a lot more than they saved. Hey, though, the Reds are still right there with the Washington Nationals on top of the East Division in the South League. In the West Division, no one is with the Astros. In the West League, it appears that the Astros are packing that South Division away. But the North Division race between the Colorado Rockies and the Minnesota Twins remains interesting and tight. We keep waiting for the Chicago Cubs to make a move, but they've actually lost a game against the lead since we last checked. In the East League, we see the Indians and the Detroit Tigers so far are lightly scheduled in that North Division. That will change. Meanwhile, the Baltimore Orioles are stinking up the South League just a little, but they've opened up a two-game lead on the Nationals in the South Division of the East League. Among the Northeast Conference clubs, the Tigers have slight leads in the stand-alone competition and in the East League North. But the Yankees are two games ahead of the Indians and the Tigers in the North League East. 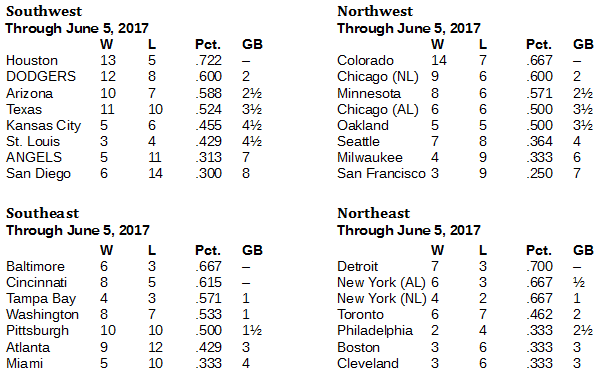 In the North League West, the Rockies are four games in front of a big scrum in the middle.